Some demos do a great job of selling their game. 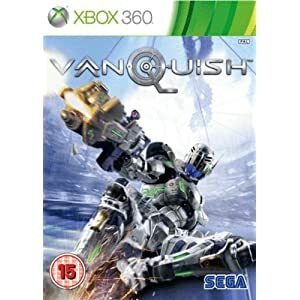 The demo for vanquish showed a tricky and busy shooter with very strong controls and some interesting mechanics. I was sold and was excited to get it after christmas. I managed to pick it up in the post-christmas sales for £13. The game harks back to America’s love of Russia. Russia have used a big ole space station to destroy San Francisco. They have threatened the destruction of New York next unless the US bow down to their demands. Your job is to stop this threat and destroy the pesky Russians. The Russians are not embodied in human form but are comprised of a series of mechs that are rather overpowered especially in boss form. This game has easily the best boss battles I have played in years possibly ever. That said in a very Japanese way the enemies’ weak points are easily highlighted with nice red lights but their size and strength makes them very formidable. The other enemies are largely similar to the geth from Mass Effect and they do a good job of keeping you on your toes largely by their strength of numbers. I would say the graphics are pretty but that is something of a given on next gen consoles these days and the sound design does a great job of building the pressure. Both do their job and the space station seems feasible as a future place for civilisation although you never get a proper idea of its layout due to moving from battlefield to battlefield. The best thing about this game and the thing that makes it great is the controls. They are tight and perfect. You always have the ability to win with quick weapon changes, strong agility and a very good bullet time effect. It is usually possible to escape from enemies attacks if your reactions are there and the cover based fighting system is very well implemented. That said the odds are often against you as the missions go on and this game is hard as nails at times. With little time to play through games these days I appreciate controls that work. Often seeing a game described as having a good story but bad controls is enough to stop me playing even if it is promising. I just don’t have time to fight a control scheme. That is what made me love vanquish, the odds may be against you but you feel you can get it done. The story may be daft and a little unimaginative but it is largely just a vehicle for the fighting and that is where the game excels. Mammoth boss fights seal the deal and I hope that the open storyline does lead to a sequel.